The Arai GP-J3 is another representation of Arai's pursuit of comfort and function in one attractive package whose simplicity and smooth lines belie the complex energy-management system within. The updated and improved shell shape and construction incorporate extended facial coverage with sculpted "FCS" cheek pads for improved support and comfort. 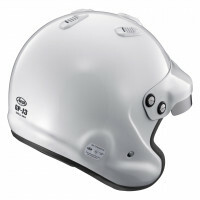 The same care and attention that Arai puts into every helmet can be found in the details of the GP-J3 open-face series. The interior fit is typical Arai, benefiting from over 50 years of research and refinement, and resulting in a helmet that more closely matches the shape of the human head.  The fit is close but remarkably comfortable, allowing for the smallest possible helmet to be worn for maximum protection. Meets Snell SA2015 & FIA 8859-2015 standards. This is the white XL version. Adjustable Peak GP-J3 has an adjustable peak that combines the adjustability of the previous Jet/f with the classic rounded styling of a more traditional vintage design. The peak also includes easily-removable/replaceable light tint anti-glare lens. Cheek Pads and the Comfort Head Liner Removable and replaceable with optional pads of various thicknesses for a more custom fit, as well as allowing for more frequent, and more thorough, cleaning when needed. Ventialtion The GP-J3 has four top vents, giving the Jet series its first-ever ventilation system. 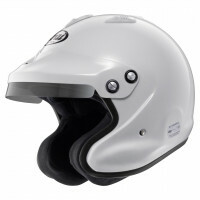 Low Center of Gravity Combined with its legendary comfort and fit, Arai concentrates on balance and a lower center of gravity. All too often, people concentrate more on the weight of a helmet instead of how that weight is distributed over the entire helmet. A lower center of gravity causes less fatigue and feels lighter on the wearers head over a full track session.